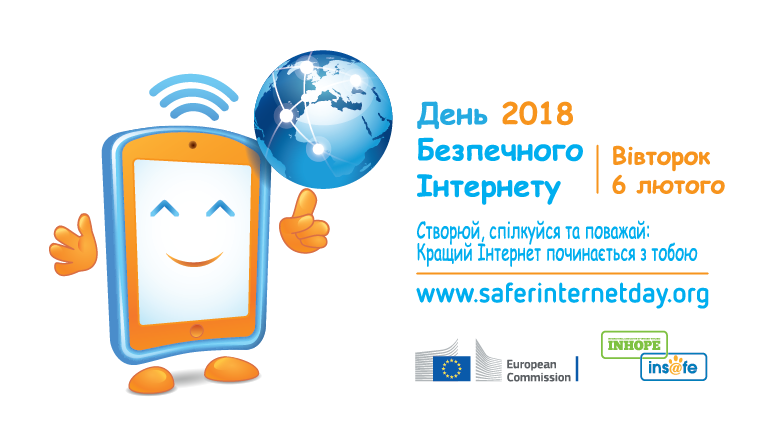 Safer Internet Day 2014 – Старт – почни з себе! February 11th 2014, within the Safer Internet Day, on the initiative of the Lugansk regional youth organization “Start” in different Ukrainian towns and cities Internet Security informal lessons were held. The authors identified the Lesson purposes as following: to acquaint the youth with some rules of the Internet behavior, to discuss virtual threats, that could harm everyone in the real life, to identify the ways that could prevent the negative impact of the Internet, to present and discuss some information about “No Hate Speech Movement”. All purposes are implemented within interactive cooperation with children and young people. In the Lesson by over 5,000 Ukrainian schoolchildren and students from Lugansk, Severodonetsk, Bryanka, Lysychansk, Sverdlovsk, Krasnyi Luch, Uzhgorod, Zhytomyr, Dnepropetrovsk, Dneprodzerzhinsk, Kyiv, Vinnitsa, Hrebinka, Donetsk, Kremenchug, Poltava, towns of Volyn and Zaporozhia region were engaged. The participants were acquainted with some rules of the Internet behavior, discussed some virtual threats, that could harm everyone in the real life. So, in different towns and cities children and young people named the dangers of material well-being: viruses, paid posts, fraud, spam, hype. Among the threats to psychological and spiritual health were named loss of time control, dependence, withdrawal from reality. The wrong body position during searching in the Internet, no breaks and charging for the eyes can harm everyone physically. During the Lesson the participants determined different ways to prevent the negative impact of the Internet on them, their relatives and friends themselves. It was offered to resist to the threats of material well-being by blocking sites filled with objectionable content, critical attitude to advertising and tracking desire to make unnecessary purchases and to pay for playing games, reducing the information about yourself and personal photos on social networks. It was offered to counter with psychological dangers by time restrictions of visiting the Internet, critical attitude to the information, limiting access to specific sites, termination of communication with aggressors and strangers, learning the rules of “netiquette” and by respecting the interlocutor. It was also suggested to do something new, fun and interesting in the real life. During the Lesson the participants got acquainted with the European Youth Campaign “No Hate Speech Movement”. Online environment is a place where human rights are often ignored or violated. Hate speech on the Internet has become the main form of violation of human rights, with serious consequences in the real life. Some of the goals of the campaign are raising awareness of young people of the hate speech on the Internet and reducing its perception online. The participants noticed some real examples of hate speech online using the posts in social networks. Some of the participants noted that they did not discuss the impact of the Internet on their attitude towards people and previous events with anyone and even did not attach any importance to this. However, at the same time they noted that some posts do influence their attitude towards a particular phenomenon or groups. Some participants suggested thinking before publishing something in the net because some posts may hurt human dignity of others. Moreover as a part of the Safer Internet Day the organization “Start” developed some recommendations on safe use of the Internet for parents. They were: to learn and to teach the child to be critical to the information found on the Internet; to create so-called “family privacy rules” and agree not to disclose personal information offline as well as online; to raise the level of computer and Internet literacy regularly. Regional television channels in different regions of Ukraine dedicated some TV shows news releases to the Internet safety not only on February 11th but in the following weeks as well. Many guests of such TV shows could appeal to parents and children, discuss the threats that may appear in the real life and different ways to avoid the negative impact of the Internet. Lugansk Secondary General School № 49.